Blood in Dermastamp - How to Clean? Hi Sarah, I just used my 1.5mm dermastamp + roller today. While using the stamp, certain areas of my face seem to bleed more than others. Blood has actually traveled up the holes in which the needles are fixed. I have run it under water several time and have been soaking it for over 2 hours now, and there is still some blood inside. Is there a trick to clean it out? While I am posting, I would also like some advice on the correct thing to do when there is a pool of blood on the face. When I stamp my scars, I bleed more in some areas, even after 2 or 3 "pokes". Today, I had a blood spot about 1.5-2 cm diameter. What do I do when this happens? Do I have to wipe it off before continuing to stamp/roll or do I just leave it? Today I just left it because I was not sure what to do. Re: Blood in Dermastamp - How to Clean? With this model, it is possible to get some discoloration caused by blood staining at the needle base. 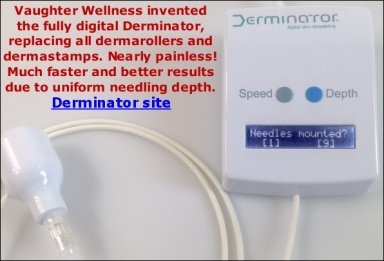 There are unfortunately no models on the market that do not have this problem, but it can largely be avoided by rinsing the needles by letting a strong stream of water run over them, needles pointed upwards. Use a 2% Chloramine-T solution to sterilize overnight. When our current stock has been sold out, we're launching our own model. Thank you very much for your reply. I had not seen that warning when I ordered my stamp and I did not think to look back on your sales page for an answer, sorry about that. I had tried rinsing it under the tap (needles up) several times, and this didn't clear all the blood out. I just tried something else that worked like a charm, so I thought that I'd share it here. I took a plant mister and set it to spray a small, tight stream of water. I then sprayed the stamp while holding it needles side up. This cleaned it out completely in a matter of seconds.